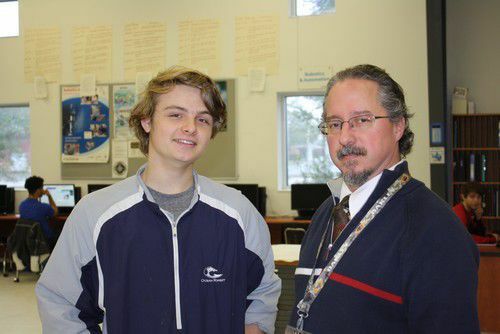 Kyle Kelly, a junior at Brunswick High School, has been nominated to serve as a delegate at next summer’s Congress of Future Science Leaders. He poses here with Rick Cutforth, an engineering teacher at the Golden Isles College and Career Academy. A Brunswick High School junior has been nominated to represent the state of Georgia at the Congress of Future Science Leaders next summer. Kyle Kelly, who also studies engineering at the Golden Isles College and Career Academy, was nominated to serve as a delegate at the event, which will take place at the University of Massachusetts Lowell. The honors-only program brings together the country’s finest high school students who aspire to careers in science, technology, engineering and mathematics (STEM) fields. A GoFundMe page has been created to help Kyle raise money to offset the costs of tuition, room and board and travel expenses. “We appreciate and are grateful for any contribution you can make to this experience,” said Caryn Kelly, Kyle’s mother. Kyle has also been nominated for the National Academy of Future Scientists and Technologists Award for his academic record and leadership potential. He previously attended an aerospace program in Orange Park, Fla., before moving to Brunswick last year. John C. Mather, the winner of the Nobel Prize in physics and the science director of the National Academy of Future Scientists and Technologists, nominated Kyle for the Congress. Delegates are chosen based on their academic excellence as well as the passion they’ve demonstrated for science. The Congress aims to groom and inspire the country’s top students to be scientists and technology specialists. Rick Townsend, CEO of GICCA, said Kyle has a clear understanding of the importance of STEM, as well as a passion for engineering. Those wishing to donate to support Kyle’s trip can do so on his GoFundMe page, which can be found at gofundme.com/4spdk5c.